H&H Printing has been printing business cards in New Orleans for 48 years. We know business cards. Start conversations on the right foot and get your name out there. Great looking business cards are one way to ensure a positive outcome to those critical first and last impressions. Networking with other professionals in your field and procuring new business for your company is highly dependent on the image you present. Be sure your professional identity, your brand identity and your business values are well represented. Handing out bright and eye-catching customized business cards will leave a great first impression as well as keep your client's interest. Your business cards should support you as well as show you off a little bit. It takes a practiced hand to strike a balance between, "Wow," and, "That business is totally on my side." 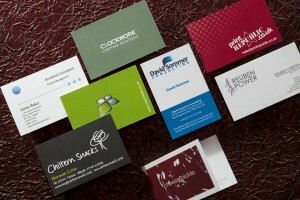 Custom business cards will enhance your brand awareness with every potential customer you meet. Whether you are dining out with your company, networking with others in your industry or talking to a friendly neighbor on the street you will have a business card that truly speaks to your brand and your professional image. H&H will meet with you to discuss your brand's identity and then figure out a plan to ensure that image is represented in the best light and in the most creative way. Available in any size and color, our Business Cards allow you implement creative designs and a personalized layout that fits your brand. Take your company to the next step ahead of your competition.